Most people would probably agree that a good chunk of Boost Mobile's phone offerings tend to be mostly candy bar phones that look to be lost in a time warp. Luckily though, there are some that offer some additional modern offerings to break the common conception that these push-to-talk phones are rugged pieces of hardware that lack variety. 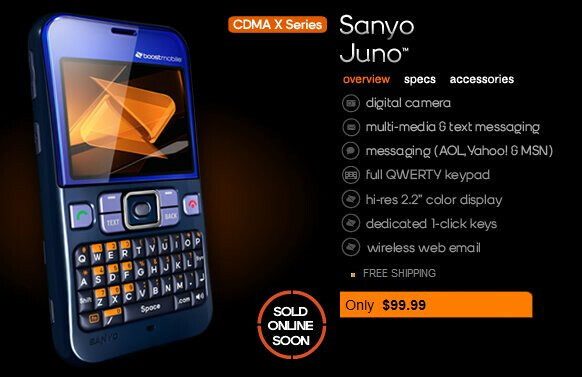 Thankfully though, the Sanyo Juno is headed to their lineup to offer a decent text messaging experience that won't break the bank. Already available on Sprint's lineup as the Sanyo SCP-2700, the Sanyo Juno is the same exact device except for its re-branded name. Following in the same footsteps, it'll sport an attractive price that won't leave you being too frugal after purchasing it. Although it'll be available to purchase online soon, you'll only need to collect $99.99 between now and the time it is released to get yourself a unit – then again, it shouldn't be too bad considering you won't be tethered down with a contract. any chance your store is in NY? i've been trying to get one but cant. Does anyone know how to clear the text history of texts made? Not the actual message but when you click on text it stores the last numbers texted I need to know how to clear these numbers out. Does anyone know if you can offload the pictures from a Juno? I can't find how to do it.